I know - I haven't blogged much this year. But it doesn't mean I haven't been pressing forward. And it's good to acknowledge progress, right? So - here I am, doing just that. At the beginning of 2015, I set some goals - and picked a one word theme. And, as I generally do around this time of year, I am going to look at them and see how I did. Do at least one specific, relatively substantial, thing to improve my children's writing craft each month (e.g. take a class, read a craft book, participate in a picture book-related challenge, get a substantial critique, etc.). Work on a picture book manuscript for five minutes or more at least five days a week the vast majority of weeks. And how did I do? I did NOT complete twelve rough drafts. I would say I managed five or six - but my focus changed a bit later, so I am fine with that. I went through my little calendar just now (I put a "w" every time I wrote a PB, and a R when I revised) and I did one or the other five times a week 35 out of 52 weeks, with the VAST majority of the rest either four or five days. I am pleased, for the most part. 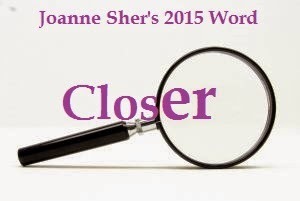 And - my one word last year was "Closer" - and I feel like it was "a success." It helped keep me focused on making progress in a lot of areas. Watch for another post in the next few days on my word and goals for 2016. I'd say you did very well on your goals last year.